Have you seen alligators at your airport? When someone comments on "the human-animal relationship", many of us nod sagely in agreement that there's obviously an inseparable connection between people and animals - but would you have picked that alligators at the airport would be used to foster that relationship, and provide benefits to human travellers? In recent years, airports around the world have recognized the power of cute, cuddly animals for soothing harried, stressed-out flyers. Flyers travelling through Louis Armstrong New Orleans International Airport this winter are being invited to pet a baby alligator as part of an animal therapy program aimed at de-stressing travellers. At first, dogs were the most popular therapy animal of choice. But then came pigs. Miniature horses. And now, in Louisiana -- home to the highest number of alligators in the US -- alligators in baby form. 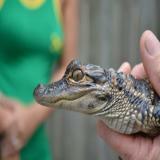 The baby alligators are between one and three years old and will be given regular breaks, airport officials say.